EVA contains various tools, computer disks, glass, metal, an RCD, and most importantly, space suits with matching jetpacks. This room is located right above the Bridge and Customs. EVA is meant to be opened only for emergencies. However, traitors usually loot EVA before any actual emergencies occur, especially if they are tasked with stealing an RCD. Now equipped with launch chutes for extra speedy death exiting! This room has no air vents. The power is supplied via a cable in the maintenance hallway just above Customs. EVA contains various tools, computer disks, glass, metal, an RCD, and most importantly, space suits with matching jetpacks. EVA is meant to be opened only for emergencies. However,traitors usually loot EVA before any actual emergencies occur, especially if they are tasked with stealing an RCD. 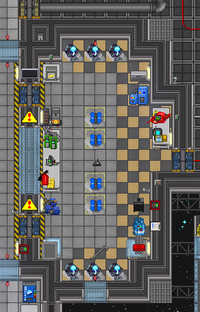 There is a conveyor belt station in the maintenance corridors just north-east of EVA proper. There is no vent. Still plenty of air in here, albeit in canister/tank form. 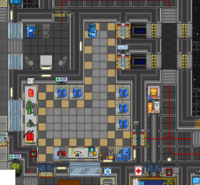 The APC for this room is near the bottom left corner, behind the oxygen canister. EVA contains various tools and supplies for repairing ship breaches, such as sheets of glass and metal, an RCD, and most importantly, space suits with matching jetpacks. 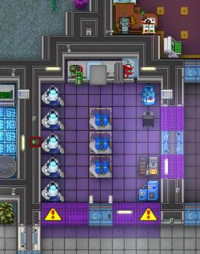 This room is located across the hall from Bar and Medbay, right next to the industrial cryogenics unit. EVA is meant to be opened only for emergencies, not that it stops traitors from looting EVA before any actual emergencies occur. Luckily, there are EVA Shutter switches to lock down EVA in case of that. EVA contains various tools and supplies for repairing ship breaches, such as sheets of glass and metal, an RCD, and most importantly, space suits with matching jetpacks. That's why this room is located across the hall from the other place useful for dealing with hull breaches and general ship damage, Tool Storage, and the other place for dealing with a ship that's full of holes, the only place that always has atmosphere, the Bar. EVA is meant to be opened only for emergencies, not that it stops traitors from looting EVA before any actual emergencies occur. Luckily, there are EVA Shutter switches to lock down EVA in case of that. EVA is a little storage room near Arrivals with all sorts of highly useful stuff for repairing hull breaches. Everyone usually goes for one of the five space helmet-suit-jetpack sets, but there's also plenty of metal and glass sheets, some wires, a utility belt or two, and a big tank dispenser thing with plenty of O2 tanks. One of the station's few rapid construction devices is also stored in this room, hidden inside a surprisingly unsecured crate with five 10-unit matter cartridges. The Syndicate would love to get their hand on one of these, so you may occasionally find some random thug trying to break into here (and usually failing). There is no vent or air injector. Not that it'd need it; there's plenty of canned air in this place. 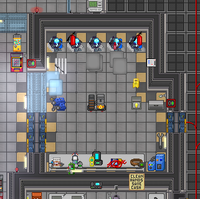 The APC for this room is on the right wall, near the tank dispenser. EVA (that's short for Extra-Vehicular Activity, although a flying deathtrap can only loosely be interpreted as a vehicle) contains various tools and supplies for repairing ship breaches, such as sheets of glass and metal, an RCD, and most importantly, space suits with matching jetpacks. (You'll notice that they are five of them--one for each head doesn't already start their own space suit.) That's why it's right close by one of the places that gets bombed often. When you think about it, this room is basically a super-Tool Storage but exclusively meant for the cool kids. Since there's so much valuable and/or useful stuff, in here, at least one person per round will be asking for the AI to let them in. The APC for this room is towards the northeast corner. EVA is where the inmates of the station go to get supplies and gear for sealing hull breaches and repairing the station, conveniently located across from the place that gets bombed the most often. 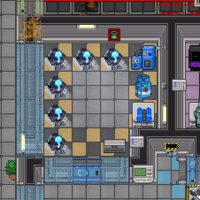 Technically, only the Heads of Staff are supposed to use this room, but when half the station is open to Space, and you're losing oxygen every heartbeat, a little rule like that usually isn't going to stop you from asking the AI to open up EVA or battering down the windows with fire extinguishers. Anyways, regardless of whether or not you actually have access to this place, there's definitely going to something for you in this room...somewhere. Everyone could use a classic SS13-branded space suit-helmet-jetpack combo, and there's eight (more than any other station) of them, so there's fairly plenty to go around. If jetpacks are too bulky for you, and you just want oxygen, there's a tank dispenser in the back with plenty of oxygen tanks. This place doesn't skimp on materials either; there's a RCD crate with a full set of matter cartridges, lots and lots of wires, and big stacks of metal and glass, including some of the rare and elusive plasmaglass. Chiron Outpost, unfortunately, does not have an EVA room. Therefore, if a man in a red suit comes up to you and asks you where EVA is, you can truthfully say the station doesn't have one! However, if one of the Heads of Staff comes up to you and asks you where EVA is, you might want to tell them to request a EVA Equipment Crate from Cargo. Tool Storage's hipper, cooler cousin. EVA is a weird purple storage room left of the Bridge & Teleporter used for storing various suits and supplies evidently important for repairing the station. It's sort of like Tool Storage, except with a more diverse, more useful variety supplies and restricted to some weirdos with green-striped IDs. Hence, the gaudy purple floortiles and plasmaglass windows and all the hordes of Staff Assistants trying to break into it every other round. What are these assistants trying to gain by breaking into here? Lots of things. Often, it's oxygen, whether it's the well-received blue tanks from the tank dispenser, the bulky, back-slot-only jetpacks (which, if you think about it, are basically like beer helmets but for oxygen), or some extra oxygen from the O2 canister to refill/top off their other air tanks. Lots also go for the flippers; in a station that floods over just about every shift, shoes that help you wade through water much faster is an absolute godsend. When Tool Storage runs out of basic materials like metal and glass, plenty try to get some from here. A few also just want their own civilian diving suit-helmet set. It's not very useful, since the surrounding ocean is temperate and mostly harmless, but it does look pretty cool. Curiously, the usual RCD crate is absent. Some say he was taken away by the same spooks who are looking for the gnome supposedly missing in Customs, but, really, they just missed their flight. There is no vent. With this much canned air around, you really don't need it. 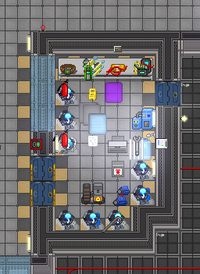 The APC for this room is on the right wall, near the top right corner. When Atlas is wracked by bombings, and landscapes are replaced by holes into Space, you can expect the EVA Storage room on the right end of the region, above the Bridge hallway, to be "mysteriously" missing items. Though the name EVA may imply equipment for work outside, all the equipment, listed below, can be used indoors, albeit with somewhat less utility. Six racks each with a space helmet-space suit-breath mask set. It protects you from the freezing cold and harsh burns caused by Space exposure, though it slows you down indoors. A canister with more oxygen, perhaps for resupplying rooms with air or refilling air tanks. A stack of six jetpacks with exceptional capacity. They also allow one to fly in Space, which is useful for navigating hull breaches, inside or outside. A RCD crate with five matter cartridges, for fixing aforementioned breaches. There is no vent. According to regulations, it's not necessary with all this canned air around, which, for once, is somewhat sensible. 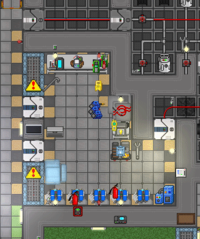 The APC for this room is in its bottom right corner. This page was last modified on 1 April 2019, at 04:18.